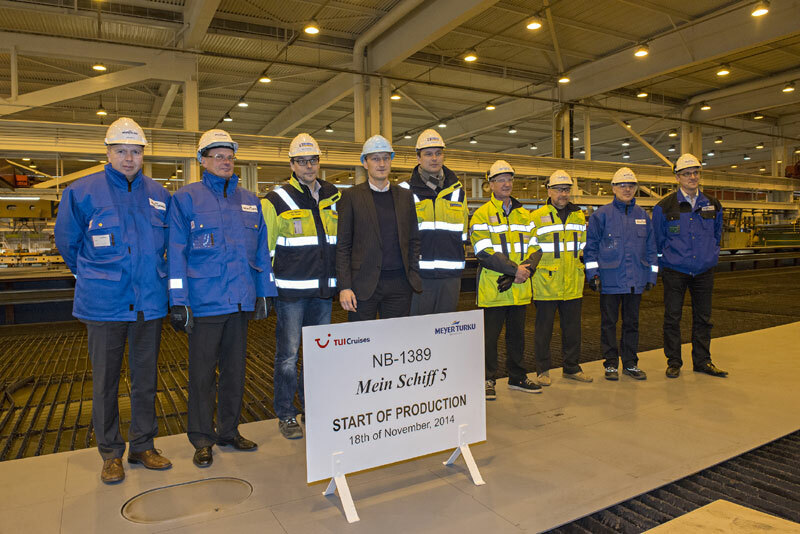 The construction on Germany’s TUI Cruises ship, Mein Schiff 5 has started. On November 18th the Turku Meyer shipyard in Finland began the building phase. The first steel was cut marking the official start of construction of TUI Cruises’ third new build. Barely a month after the launch of the Mein Schiff 4, the Hamburg-based cruise line is thus setting a further milestone in the company’s expansion. “We have set ourselves ambitious goals for the next few years, with plans to expand our cruise fleet between now and 2017 from three ships today to six, with 14,000 beds in total,” says Wybcke Meier, CEO of TUI Cruises. On June 5, 2015, with the Mein Schiff 4, TUI Cruises will name a ship in Kiel for the first time. The Mein Schiff 5 and the Mein Schiff 6 are scheduled to go into service in 2016 and 2017 respectively. The new additions to the Mein Schiff fleet will also have a focus on well-being and spaciousness. Like their sister ships (the Mein Schiff 3 and the Mein Schiff 4), they will be 295 meters long, have 15 decks with around 1,253 cabins accommodating approximately 2,506 passengers in total. 90 percent of the cabins are outside cabins, 82 percent with balconies.